Comfort designed for business travelers. This historical hotel located in the heart of downtown Fort Worth surrounds travelers with the conveniences that make business and pleasure travel easy. Relax and get ready for the day ahead in one of our 203 spacious guest rooms, featuring a comfortable sitting area, large work desk with FREE high speed internet access, two phones with data ports. 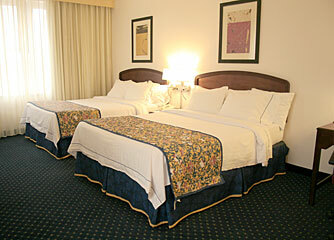 All rooms are equipped with hair dryers, full size iron and ironing board, and an in-room coffee maker. The Corner Bakery Cafe, located in the hotel, serves breakfast, lunch and dinner. Room delivery is available for dinner compliments of Chili's Restaurant. Unwind in our open year round outdoor heated swimming pool, indoor whirlpool, and exercise room. Courtyard by Marriott ... the hotel designed by business travelers.